This is an original 1957 Chevrolet instrument cluster dash housing for all models including the Bel Air, 210, and 150. The housing is media blasted and ready to paint. 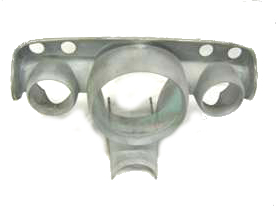 The housing provides mounting for the speedometer, fuel gauge, temperature gauge and dash indicator light. The housing does not include any hardware, gauges, or chrome.